Edible cookie dough may be the next best dessert to hit the shelves. Thanks to Dhea and Karla Hudson, owners of Okie Dough, this tasty treat is now available across Oklahoma. The cookie dough is made without eggs or added milk and made with heat-treated flour, so it is completely safe to eat. Available in about 15 flavors, Okie Dough can be eaten straight from the freezer or refrigerator because it lasts up to 12 weeks in the freezer and up to eight weeks in the refrigerator. The most challenging part of being in the business is making it clear to customers that the product is safe to eat, Dhea Hudson said. The idea behind Okie Dough started in school when Dhea was a high school counselor. The business began in April 2017. 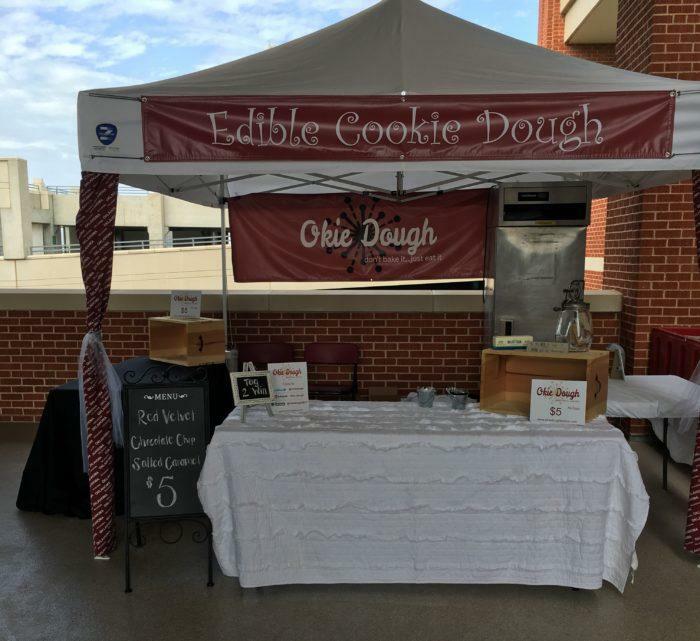 In the first year, Okie Dough made it to 10 festivals, all home Oklahoma University football games, the Cox Convention Center, the Chesapeake Arena for all Thunder games and events, the Texas Motor Speedway, and many more. Okie Dough also joined the Made in Oklahoma Program this year. The product is made using flour from Shawnee Mills in Shawnee, Okla., butter from the Hiland Dairy in Chandler, Okla., and Griffins Vanilla from Muskogee, Okla. For more information, visit madeinoklahoma.net/products/okie-dough, okiedoughlicious.com, or find Okie Dough on Facebook. 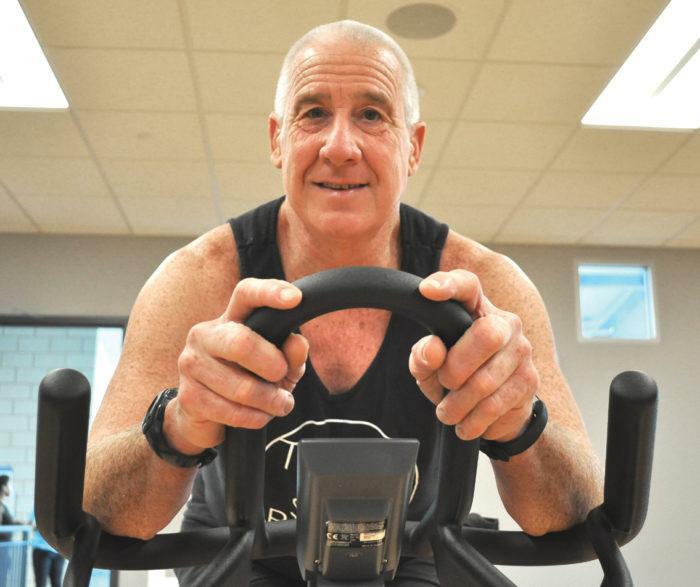 Jay Moore, 61, is beating athletes a quarter of his age biking, running and swimming across the country. Get fit, get fitter or get fittest. That’s 61-year-old Jay Moore’s motto. Moore teaches six spinning classes a week – an hour of pure, heart-pumping stationary cycling at a time at The Station at Central Park in Moore. When he’s not on the bike he’s teaching a master’s swim class at six in the morning. When he’s not doing that he’s competing in Oklahoma, around the country or even around the world as a member of Team USA. Moore starting doing triathlons back in 1989 and continued through 1994 when a knee injury sidelined him. Seventeen years went by and his waistline surpassed his belt. At the end of 2010 he weighed 250 and had had enough. He trained for a year and won his first race. He’s been on Team USA for five years in a row. “They’ll ask me ‘what’s your secret,’” Moore said. His secret is getting wet. Weekly, he swims three or four miles spread out four or five days. He’s found that his arthritic shoulders respond well. “The less I swim the worse I feel,” he smiles. Moore’s spin class is one of the more popular offerings at The Station at Central Park in Moore. Entry tickets to his class at the front desk are often scooped up before a single pedal is even turned. People come to sweat, but they also come to get some of Moore’s energy. At 61, ego and competition still fuel him. He went to the world championships last year against his doctor’s advice. A couple months later he went to nationals and finished sixth on a bad knee. He usually runs seven-minute, thirty-second miles on a 5K trail but his knee slowed him to a 9:15 pace. It was his swim times that put him so far out in front. When Moore competes he’s typically facing 500-meter swims combined with a 12.5-mile bike ride and then a 5K run. Olympic distance races carry one-mile swims, a 25-mile bike ride and a 10k run. When he’s not training he’s running a business. Moore started in the flooring business at 16. He traveled for 15 years as a suit-and-tie rep.
“My dad bought me a truck at 16 and said you need to go learn how to lay carpet,” he said. “In college I could work on Friday afternoons and Saturdays after the other guys had already gotten their check and were at the bar and wouldn’t show up. In 1982 he hit the road with a $40,000 salary and all expenses paid. Along the way he picked up a certification to be a moisture tester. Since 2009 he’s owned Floors by Moore. He operates on a wholesale mentality. He thrives on the hunt. On land or in the water, he wants to be first. “I put it all out there. I’ve puked at the finish line quite a few times. I’m just so competitive,” Moore said. Ms Oklahoma Senior America 2018 Kay Manning of Oklahoma City. 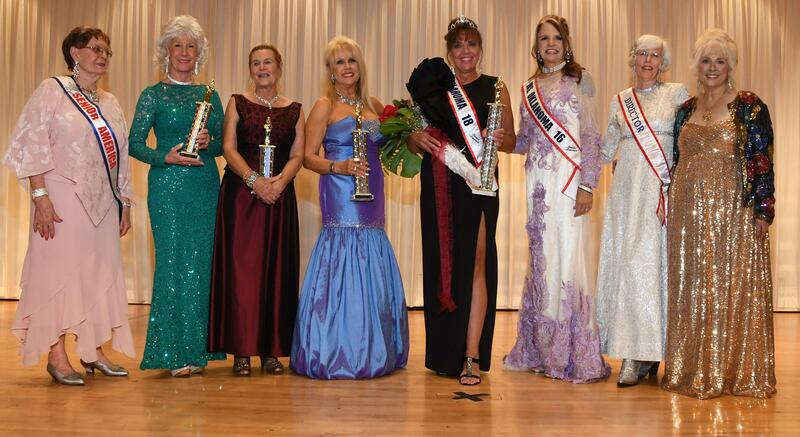 Left to right: Administrator Ladell Maxwell, 2nd Runner Up Marilynn Blackmon of Ada, OK, 3rd Runner Up Judy Jackson of Mead, OK, 1st Runner Up Kathryn Carroll Gordon of Newalla, OK, Ms Oklahoma Senior America 2018 Kay Manning of Oklahoma City, OK, Ms Oklahoma Senior America 2016 Dove Schmidt, Director Wynelle Record, Director Dorothy Lilies. 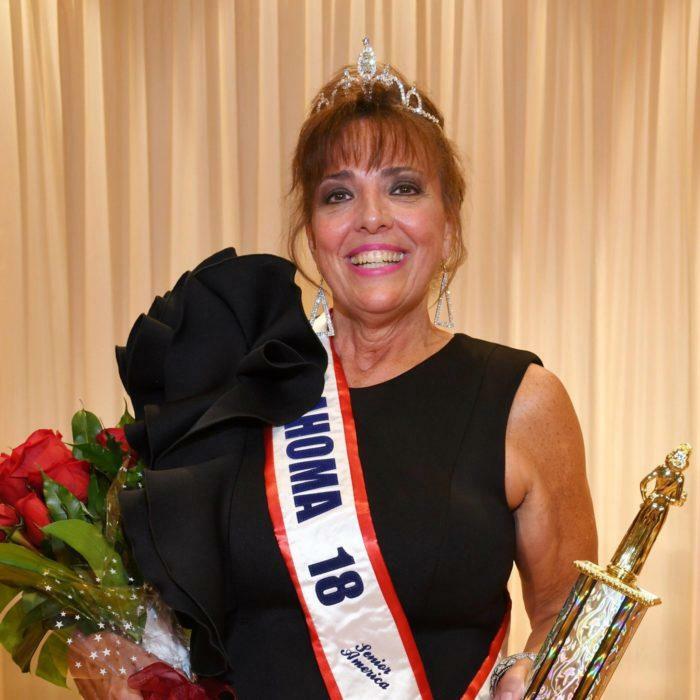 A very surprised and happy Kay Manning was crown Ms Oklahoma Senior America 2018 on Saturday, July 21. God is first, because without Him none of this would be possible and I would not have met so many great people along the way. I am the daughter of Patrick and Jeanette Manning, spirited Oklahomans, Citizens of Potawatomi Nation Native Americans, and in a family of Sooner fans. I have a daughter, Brooke and two grandsons, Peyton and Bivin that bring me a lot of joy and keep me young at heart. I am an active participant in the Catholic Church, reading at Mass, fulfilling my need to give back for all I have been given. Recently I joined another family, the Oklahoma Senior Follies. They are the most colorful and exciting group of people I have ever had the pleasure to be around. As a teacher I work with many active seniors and try to encourage my friends to attend or volunteer. I enjoy promoting senior programs. Kay Manning is a teacher for the Oklahoma City Public Schools. She attended the University of Oklahoma, Marymount College of Salina, Kansas and University of Central Oklahoma (UCO). Kay transferred from OU to Marymount College where she received her Bachelor of Arts degree and an Associate in science. She later attended UCO where she earned her Early Childhood Certification in teaching. Her experience in the theatre began in OKC at Bishop McGuinness High School where she played the role of the eldest daughter, Tzeitel, in “Fiddler on the Roof’. She attended Marymount College in Salina, Kansas, and performed in “Pippin”, “Camelot”, “Annie Get Your Gun”,” Next”, “Orpheus Descending”, “Waltz of the Toreadors”, “The Children’s Hour”, and “Lysistrata” to name a few. Kay also performed the role of Jocasta in “Oedipus Rex” at Marymount College and the Manhattan, Kansas Community Theatre. In 2004, Kay was selected from over 500 singers auditioning to sing in a competition for News Channel 9 called “Gimme the Mike”, Oklahoma. First Runner Up is Kathryn Carroll Gordon was born in Midwest City. She became a member of the original Oklahoma Twisters Gymnastic Team in the 1950’s. She became 1st Place Jr. Olympic Tumbling Champion, 3rd Place National Tumbling Champion and a member of the United States Pan American Gymnastics Team to Winnipeg, Canada. Kathryn graduated from Milford High School in Connecticut, where she trained in gymnastics for the 1968 Olympics. She attended the 1968 Olympic trials in Long Beach, where she qualified for the finals. Kathryn graduated from the University of Central Oklahoma with a Bachelor of Science Degree and a teaching certificate. She was on the Honor Roll and received an Outstanding Gymnast award. Recently, Kathryn graduated from a Getting Ahead class and received a State of Oklahoma citation signed by Senator Ron Sharp and Representative Dell Kerbs. Kathryn’s past work history includes teaching in Mid-Del School system for 12 years; owning and operating the Edmond School of Gymnastics for 10 years and selling insurance for ten years, where she received many awards as a Million-Dollar Producer. Currently, she is working as a licensed cosmetologist. To satisfy her creative side, Kathryn has performed comedy at the Oklahoma City Joker’s Comedy Club where she opened for comedians, Mack & Jaimie, acted in many commercials and training videos, tap danced as a member of “A Class Act” at the 2017 fundraiser for the Ms. Oklahoma Senior America Pageant, the 2017 Senior Follies, the Veterans’ Center as well as at various nursing homes and assisted living centers. Kathryn is a member of Eastern Star where she donates her time to worthy causes. She has donated time to Project Gabriel in Shawnee, which helps pregnant girls with supplies for their babies as well as counseling. Kathryn currently attends Westminster Presbyterian Church. She is blessed with a daughter and a son who are successful as a Computer Engineer with Microsoft in Seattle and a Graphic Designer in Salt Lake City. She is proud, too, of her four grandsons and two granddaughters. She loves spending time with her family and friends. Second Runner up Marilynn Blackmon is the mother of two children and has three grandchildren and three great grandchildren. She worked as a secretary in her 20s, and later went into sales and started her own interior design business “Interior Reflections.” Some years later she changed focus and started a new business, “Pen & Pencil” office supply. As she turned 60, she went back to college, joined Toastmasters and reinvented herself. She became certified in Workforce Training and Development, and she was an Adjunct Instructor at Eastfield College in Mesquite, Texas, for three years. Then she moved back to her hometown of Ada, Oklahoma, in 2008 to completely restart her life where it began. Since that time, she has been Adjunct Instructor/Trainer at Pontotoc Technology Center in Ada for 12 years. Her goal is to help others learn to feel good about themselves and reach their full potential, which she does in every class she leads. She has a business called Fly without Baggage, and is a certified Master Coach in self-esteem elevation for children and adults. She is a public speaker whose theme is to enlighten and encourage others. She is a member of Toastmasters, Owls’ Book Club and National Speakers Association. Her other interests include computer technology, singing, reading, fishing, jigsaw puzzles and her friends from Ada High School Class of 1960. She volunteers as associate Sunday School teacher at her church. Third Runner Up Judy Jackson says she is greatly blessed, highly favored, and deeply loved by God through Jesus Christ. She is a Christian, a loving wife and a great mother. She has two sons, one lives nearby and the other is in Heaven waiting for her. She is a wonderful grandmother, a fabulous friend and an excellent teacher (retired now, from Middle School), but she still loves to teach any age group who is willing to learn. Judy is devoted to God, family, community and her Country. She believes in loving, living, laughing and spreading kindness everywhere she can. She believes we all have a purpose in life and hers is to spread encouragement in every way she can. Judy says we all need to learn something new every day until we take our last breath. She says she is like a goose, she wakes up in a new world every day. Judy says learning is living, and living is exciting. Trying to be the best person she can be helps her to be better at all the things that are important to her. It is her goal to get people excited about life and what they can do. Judy says getting someone to feel good about helping themselves to feel good about who and what they can be is an all-time high. Judy works as a volunteer so she can help someone else to have a better life. She feels doing so gives her a better life. She believes if she can teach, encourage and lift someone’s day then she is doing the job God has planned for that day. With Random acts of kindness and giving a smile or a compliment to someone, she can brighten their whole day. According to Judy, we all just need a kind, encouraging word, or even just a quick prayer. It lets the world know that you care. Someone must care, so why can’t it be me. In her small way she likes to believe she makes a difference. Her small part starts with her being the best person she can be, just being there when someone needs a smile, a hug or just a kind word. She feels this is her small corner of the world, and it’s her job to make it the best world she can create for that day. Judy affirms she is a very blessed woman, and it is her treasure to pass a blessing or act of kindness on to someone else. That is who she is. Betty Bradley, Duncan; Rita Engel, Ada; Pamela Holtzberger, Oklahoma City; Barbara Ann Krantz, Shady Point; Gayle Orf , Claremore; Shirley Shroff, Broken Arrow; and Winnie Stanberry, Tulsa. Vera Doughty, RN has worked as a nurse for 63 years. She is doing what she does best; sharing her love with her extended family at the Children’s Center Rehabilitation Hospital. It takes a special person to be a nurse. It also takes a special person to be a nurse for 63 years. One special person is Vera Doughty, RN. Her whole life has been dedicated to doing what she does best, loving and caring for others. 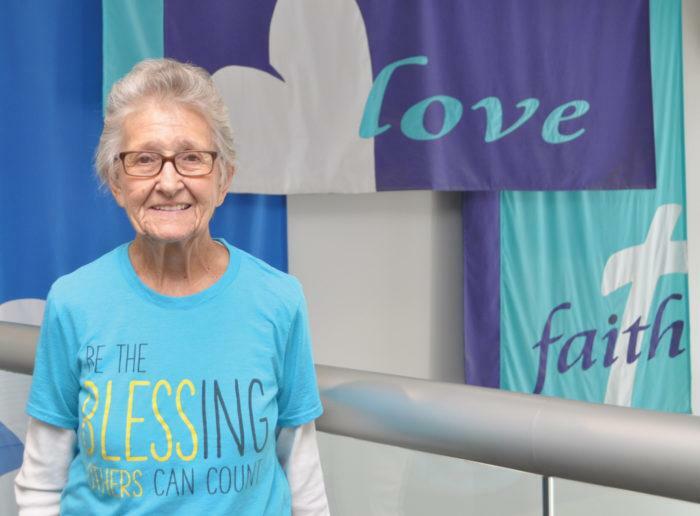 For the last 28 years, Vera has spent her time at the Children’s Center Rehabilitation Hospital sharing her motherly love as she cares for the children. Growing up in Crescent, Oklahoma, Vera moved to Oklahoma City to start Nursing School in 1952. “When I was a little girl, I didn’t always want to be a nurse; I wanted to be a Veterinarian. That was in the early 40’s and 50’s and I knew if that was the case, I would have to deliver cows and horses, and with my little, petite size body, I knew I wasn’t big enough to handle that, so I became a nurse,” she replied with a laugh. Can you image me trying to deliver a cow?” she asked. “Yes, I have always loved animals. I remember when I was a little girl; I took care of a lot of animals; Cats, dogs, and chickens. When all of the other little girls were playing with their dolls, I was out playing with the animals. I guess you could say I was playing nurse and nursing them back to health,” she replied. Vera went to Nursing School through Saint Anthony’s Hospital. “My first job as a nurse was at Saint Anthony’s Hospital and then I worked for 2 family practitioners. They were partners in the doctor’s office. Both of them were so good and they taught me a lot of what I know today. One of the doctors ended up passing away and the other doctor retired, so all of a sudden, I didn’t have a job. I found a job that I really liked and that was 28 years ago. They were such good doctors and I was the only nurse they had. After one doctor passed away and the other one retired, I had to find a job,” Vera said with a laugh. “I came here to the Children’s Center and I never left, so I must like it here,” she added. In Vera’s opinion, it takes several qualities to make a good nurse. “A nurse has to be observant of what’s going on and they have to be interested in the patient. They have to be caring and have a real desire to take care of others,” she said. It takes a mixture of love and determination, always following through and never giving up, being kind and considerate to others, always setting a goal and reaching for it, this is a mixture of Vera’s strongest assets. Working in the yard and playing with her great-grandkids is what Vera does in her spare time. “I stay busy and enjoy every minute of it,” Vera said. I asked Vera where she would travel to if she could travel anywhere in the world and she replied with a quick answer, “Oh, I would go to Switzerland. “My grandparents lived in Switzerland and I always thought it would be nice to go see where they lived. Plus, I have always been fond of the movie, Heidi. The green grass, the rolling hills… I always thought it would be a great place to visit. A beautiful place to go if I were to travel, but I don’t think I will be going there anytime soon,” she said with a smile. “If I were to give advice to someone going into the medical field, I would tell them have a real desire for it, don’t do it for the money or the prestige, do it for the love that comes from within your heart,” she said. “They would need to have a real desire to take care of other, never expecting anything in return. Whatever they did, they shouldn’t do it for the money, not for the prestige, they need to do it from their love for others,” Vera said. Words to live by: “Oh that’s an easy one. The Bible,” she replied. Melissa Holland, right, is encouraging seniors like Wavel Ashbaugh to share their life stories with future generations. What started with an email from a 15-year-old high school sophomore in New Jersey has turned into Oklahoma seniors recording their history for future generations. 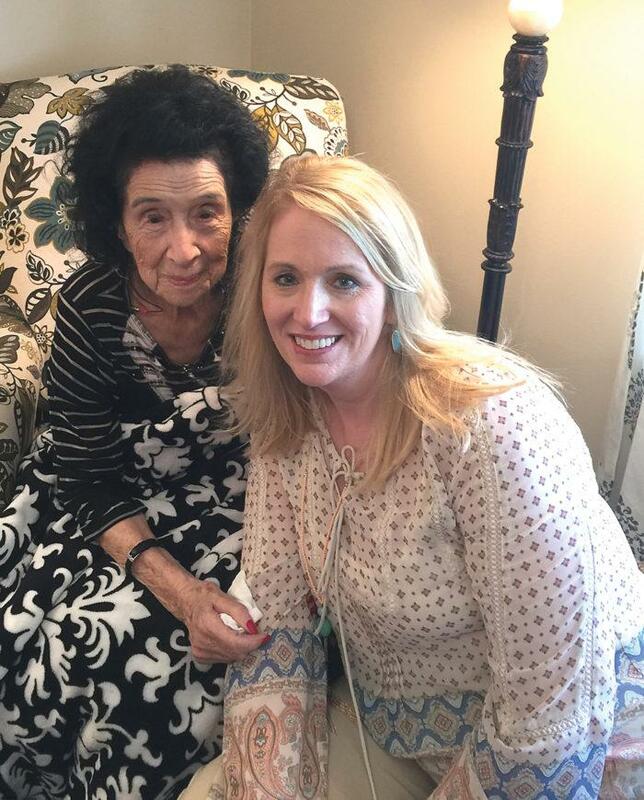 Melissa Holland serves as the executive director of the Oklahoma Assisted Living Association. An email from Michael Naya, Jr., showed up in Holland’s inbox a few months ago. Holland mentioned each spring OKALA recognizes those over 100-years-old. A friend at the Oklahoma State Department of Health mentioned those who witnessed the Land Run might be a good source of information. Veterans of the Korean War and World War II survivors might also be a good source of information. With her head swirling with ideas Holland got back to Naya and the two hammered out an informational survey OKALA could send to each member’s Activity/Engagement Coordinator. “He’s such a great kid,” Holland said of Naya. “It does give you hope in future generations. Holland said the goal is to publish the returned information in a book form. The Oklahoma Assisted Living Association is a non-profit organization dedicated to the preservation of dignity and choice for older Oklahomans and to the quality of their care in the senior living setting. Naya said it was a school project that struck up his curiosity and led him to contact Holland. “Well, I have always been interested in history starting when I was very young,” Naya said. “I enjoyed reading about the Titanic and events from that era as it was interesting. From there, I learned about World War II veterans, Great Depression and Dust Bowl survivors and decided to start finding and interviewing living witnesses from these historical events. Naya’s goal is to collect enough responses to one day write a book. “They hold a great deal of knowledge and it’s amazing to interview them in any way possible,” he said. Holland has more and more stories to share as time passes. “We get some really interesting responses,” Holland laughed. One resident survived the Dust Bowl. She recounted those days in her responses. “There were terrible dust storms that were so bad you couldn’t drive. You just had to stop and wait till it was over,” she remembered. The same resident also lived through the Great Depression. “It was terrible. We didn’t have any money and couldn’t find work,” she said. She remembered how many of her classmates struggled during those times. Her parents didn’t lose their jobs because they farmed. The end of the Depression was a miraculous event. Another resident responded to the call for 100-year-old stories. Lois Wooten was born in 1914 and just turned 104. “When I was a child the world was much safer,” Wooten said. “We did not have locks on our doors. In the summer we would sleep out in the back yard because it was so hot and we didn’t have electricity. We didn’t have running water in the house. We had a well just outside of our back porch. Things were much slower back then. Wooten remarked how much has changed. “We didn’t get the news within five minutes of when it happened,” she said. “Communication of world events was over the radio and we didn’t have one of those for a long time. Wooten’s age has brought her plenty of attention. “I am enjoying many things because I’m this old,” she said, noting she’s had a lot of interview requests and has been contacted by researchers. “There have been so many changes. Who would have thought we would have gone to the moon or astronauts would live on a space station.” While she admits the current technology “boggles my mind” she regularly uses a computer, an iPad and an iPhone, which she uses to text her family. If you would like to find out more information or participate in the project you can contact Holland at 405-235-5000 or email her at mholland@okala.org. Arthritis is the leading cause of disability in the United States. But it’s actually many distinct diseases: two of the most common are osteoarthritis and rheumatoid arthritis. Osteoarthritis, the most common version of arthritis, stems from wear and tear that erodes the cartilage between bones in your joints, causing them to rub against one another. OA affects an estimated 31 million people in the U.S., typically impacting hands and fingers, hips, lower back and knees. Pain associated with OA often worsens with use and improves with adequate rest. People are more likely to develop this form of disease with age, but that isn’t the only contributor, with obesity, traumatic injuries and overuse also elevating your risk. “Doctors typically recommend that people with OA engage in regular physical activity, which not only strengthens muscles that support the joints and helps control weight, but it also has been shown to reduce pain,” said Chakravarty. “It can typically be treated effectively with nonsteroidal anti-inflammatory drugs like aspirin or ibuprofen. In extreme cases, doctors may inject corticosteroids into joints to relieve symptoms. “Unfortunately, current treatments can only alleviate symptoms, as we haven’t developed a cure for OA,” said Chakravarty. Rheumatoid arthritis, meanwhile, is less common than OA, affecting about 1 million Americans. While its exact origins remain mysterious, researchers know the disease is caused by a dysfunction in the immune system. RA displays all the symptoms of osteoarthritis, plus noticeable joint swelling. Unlike osteoarthritis, though, RA symptoms are often worse in the mornings or after prolonged inactivity and improve a bit with use of the joints. As with OA, doctors use anti-inflammatory drugs and corticosteroids to treat the joint pain and stiffness that comes with RA. However, rheumatologists also rely on a series of more specific disease-modifying therapies that can slow the progressive destruction of the joints. While these drugs, which include methotrexate and newer biologic agents such as Humira and Enbrel, help control RA, they have no effect on osteoarthritis. For this reason, Chakravarty said, it’s important to visit a physician if you’re experiencing joint pain or stiffness. Doctors use a combination of a physical examination, blood tests and X-rays to determine the type of arthritis a person has. 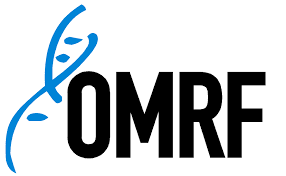 At OMRF, scientists are currently seeking volunteers who are concerned about developing rheumatoid arthritis for a prevention study called StopRA. If you are interested in participating or finding out more about the study, please call 405-271-7805 or email clinic@omrf.org. The motto of improvisational comedy. A basic tenet of improv is to make your partner look good. The same holds true for making sure your loved one is listened to, respected and celebrated in their efforts to engage in life, whatever their current perspective. Join the Alzheimer’s Association, in partnership with OKC Improv, for this workshop to help caregivers let go of the need to control (or even know what happens next) in order to discover the gifts in every experience. Learn to utilize basic improv skills to surrender to the reality of the moment and find the way to embrace the joy of our relationships! Andy James ,assistant director and fire management chief for the Oklahoma Forestry Services. Oklahoma Forestry Services announces the promotion of Andy James to assistant director and fire management chief. James will lead the state’s wildfire suppression and mitigation operations, as well as provide leadership for the division’s field operations based out of Tahlequah, Wilburton and Broken Bow. A 22-year veteran of Oklahoma Forestry Services, James previously served as the area forester for Community Fire Assistance programs, providing assistance to rural fire departments and communities. Prior to that he has served in a variety of positions including leading the Southeast Area operations located in Broken Bow, service forester in Wilburton and district forester in Jay. Wildland firefighting has been a big component of all of his positions with Oklahoma Forestry Services. Throughout his forestry career James has focused on wildland fire suppression and management, not only in eastern Oklahoma, but across the state as a task force leader, division supervisor and operations chief for the OFS Interagency Type 2 Incident Management Team. 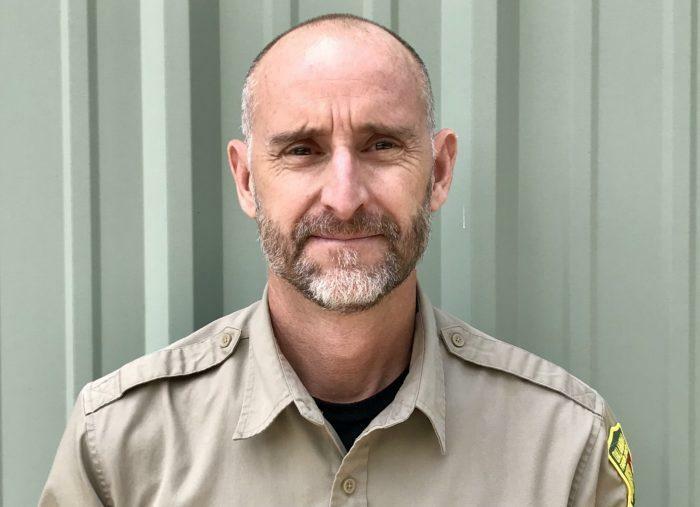 In addition to his duties with Oklahoma Forestry Services, Andy is a member of the Northern Rockies National Type 1 Incident Management Team, and is qualified as an operations section chief, type 2 and an operations section chief, type 1 (trainee). He is also a member of the Fuels Management Committee of the National Wildfire Coordinating Group and the Oklahoma Statewide Mutual Aid Working Group. Maybe you’ve hear the old tale of a little boy named David who walks to school down the same street every day. And each day he passes the house of an older couple. Actually, they’re not that old…maybe in their 60s. David always says yes. David walked by there for five years…but he never saw the couple leave the house. Then one day David passes by, and the old lady’s in the yard, and she’s crying. “What’s the matter?” David asks. Well, David never could get that image out of his head. And now, 30 years later, he and his family never miss a chance to travel together. Yes, it’s always prudent to plan for tomorrow. But David discovered it’s also important to live for today. Baptist Village – 9700 Mashburn Blvd. Warr Acres Community Center – 4301 N. Ann Arbor Ave. Brand Senior Center – 501 E. Main St.